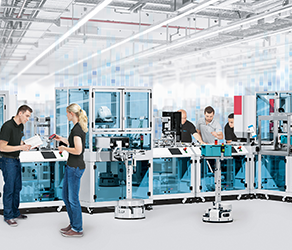 Festo Canada of Mississauga, ON, has joined the advanced manufacturing supercluster called Next Generation Manufacturing Canada as a founding technology partner.Globally, the Esslingen, Germany-based, family-owned solutions provider for industry is a key driver in the development of Industry 4.0 concepts and products for the digitalized factory environment. “It’s also part of our corporate vision to invest locally in each of our markets to develop and apply technologies and solutions, even beyond our customer base,” says Roger Hallett, president and CEO of Festo Canada. “The more than 130 Canadian companies and institutions partnering in NGM Canada will help spread new production technologies sooner and faster across Canadian industry than would otherwise be the case. This industry-led supercluster, supported by the federal government, was officially launched earlier this year. Festo’s commitment to implementing advanced manufacturing concepts and technologies in the local business eco-system also is underscored by the commitment of Festo Didactic, its global skills development and industrial training division, to partner with Canadian technical and training institutes. Recently, Festo Didactic announced a five-year workforce development training program with Humber College in Toronto. Students and employees of advanced manufacturing companies will receive hands-on training to learn the Industry 4.0 skills necessary to succeed in an evolving economy. The partnership includes the installation of the first Cyber Physical (CP) Factory in English Canada. The CP Factory is a hands-on learning and skills development model for research and engaging in industrial simulations using advanced manufacturing concepts. A CP Factory was installed last year in Montreal as part of a similar partnership with the Centre de Recherche Industrielle du Québec (CRIQ).